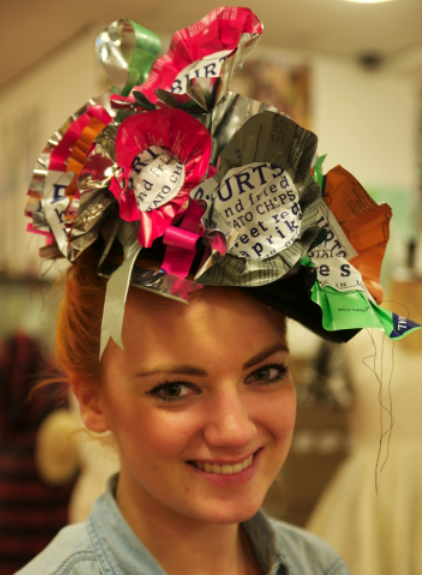 Plymouth College of Art fashion students have been exploring a unique and truly inspired way of recycling old crisp packets – by creating an outfit out of them to take to the races! A fabulous dress and matching accessories have been designed and assembled by talented young students Billie Cox, Alice Smyth, Jessica Dyer and Hazel Symons who are all in the first year of their BTEC Extended Diploma in Fashion and Textiles at the College. The students’ colourful and flamboyant outfit, made using Burts Chips packets, will be unveiled to the public at Exeter Racecourse this week. The entire outfit will next be paraded in all its glory on Ladies’ Day at the Cheltenham Festival from 13 to 16 March. This outing will provide tremendous exposure for the budding fashion designers, whose vibrant Burts Chips dress is sure to make a statement amongst the sophisticated and glamorous attire typically worn for a day at the races. There are even plans to enter the dress in the Festival’s famous best dressed lady competition on the Wednesday of the four day meeting, where it will go up against fierce competition from some of the most stylish ladies in racing.